Saliva officinalis originates in Mediterranean regions, and is well known as a culinary and medicinal herb. It is largely used for digestive and menopausal problems, particularly hot flashes, and is traditionally associated with longevity: modern research has shown that it can slow the progress of Alzheimer’s disease. 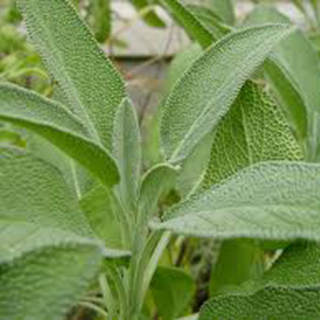 Garden sage is a valuable antibacterial, antiviral and antifungal agent. Taken internally, the herb will fight infection and will also diminish secretions of all kinds, including perspiration and saliva. Garden sage tea or tincture is specific for drying up milk production during weaning. The herb stimulates memory. Drink 1 cup (1–2 tsp leaves per cup of boiling water) 3 times daily for diarrhea, to help improve digestive function in debility, or to ease menopausal symptoms, including night sweats. It can also help dry off milk at the weaning stage. Use 1 cup of above infusion as a gargle for sore throats, tonsillitis, quinsy, or as a mouthwash for mouth ulcers, gingivitis, etc. Take 20–40 drops (1–2ml) of tincture 3 times daily for the menopause or as a tonic for digestive function. Use 16fl oz (500ml) of above infusion as a final rinse to control dandruff or restore color to graying hair. Used as a household standby in many parts of Europe for treating minor cuts and scrapes. Prefers neutral to alkaline soil and full sun. Sow seeds in 3in (7.5cm) of compost in spring or summer and plant out the following year when sturdy, or propagate from softwood cuttings in summer. Prune after flowering and in early spring to stop the plant becoming too straggly. Cropped just before flowering in summer, or collect the leaves to use in cooking throughout the year.